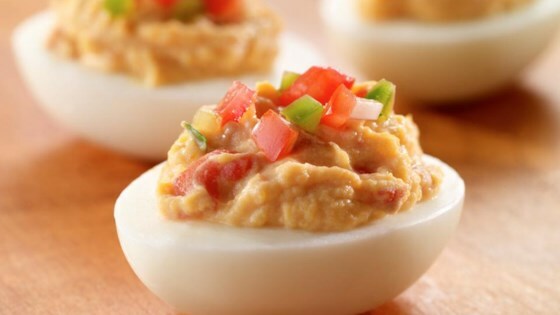 "These deviled eggs are filled with a creamy mixture of cooked yolks, sour cream, and salsa. Top them with salsa and chopped fresh cilantro for more flavor." Cut eggs in half lengthwise. Remove egg yolks; place yolks into bowl. Mash yolks with fork. Add 3 tablespoons salsa and sour cream; mix well. Spoon about 1 tablespoon egg yolk mixture into each egg white half. Top each with about 1/2 teaspoon salsa and garnish with cilantro, if desired. Cover and refrigerate until serving time or up to 24 hours. These were perfect as written! Best with fresh homemade pico de gallo. It was good but I wound up adding paprika paprika, extra sharp cheddar, salt pepper and a little Texas Pete.